I needed this today. The whole thing. The cup of coffee. 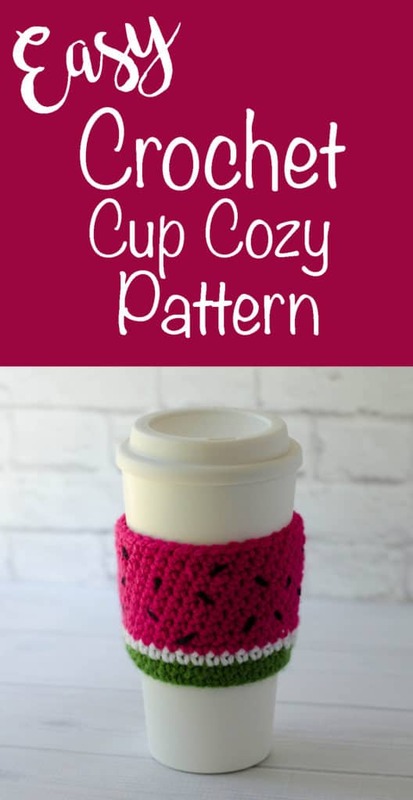 The cheery watermelon cup cozy. And that fantastic, uplifting mantra. The whole. big. fat. thing. We started out the weekend with “nothing planned”. And somehow it morphed into my father in law rushed to the hospital with some really awful, bad stuff. We’re talking “this might be it” stuff. And on top of the awful, he has Alzheimer’s. And you don’t know if that makes it better (because he doesn’t understand) or worse for the same reason. During the long hours at the hospital, I brought my crochet, because, let’s face it, it is almost always with me. But you know what? I couldn’t crochet. Not a stitch. All I could do is sit there and watch and feel all kinds of awful for my husband and all the things that he must be feeling and thinking. Do you ever feel that way? So awful that you can’t even do something you love? And after that long horrible day after the long horrible weekend, I went to my 8-5 job. I got to my desk and felt like shutting my office door and having a good cry because sometimes that makes you feel better even though it makes no sense at all. But I didn’t. I went about my ordinary day and my ordinary life on a day that didn’t really seem that ordinary at all. And then.. this watermelon cup cozy. I love it. I’m not sure if its the contrast between the bright pink and green goodness against the white cup. Or perhaps it reminds me of the fleeting summer and the happy time I spent crocheting it. It makes me smile when I see it. And today, it’s bright goodness makes me happy. And for now, that’s enough. For as much as I’ve looked at cup cozies, this is my first go at making one. And you know what? It is is the easiest thing ever! I think you will love how easy it comes together. Now.. here’s the most important part. Before you join your chain, hold it around the cup you are making it for. It should be a snug fit. If you can’t touch the 2 ends of the chain, add a few more chains until it meets. If your chain is loose or overlaps, undo a couple of chains. When it is the right length for your chain and cup, carefully join it to the first stitch, making a large loop. R1-2: Ch 1, sc in same stitch as joining and in each stitch around. Join to 1st st.
R3: With white ch 1, sc in same stitch as joining and in each stitch around. Join to 1st st.
R4-13: With pink, ch 1, sc in same stitch as joining and in each stitch around. Join to 1st st.
Weave in ends. Then take black yarn and make little stitches on the right side for the watermelon seeds. And that’s it. 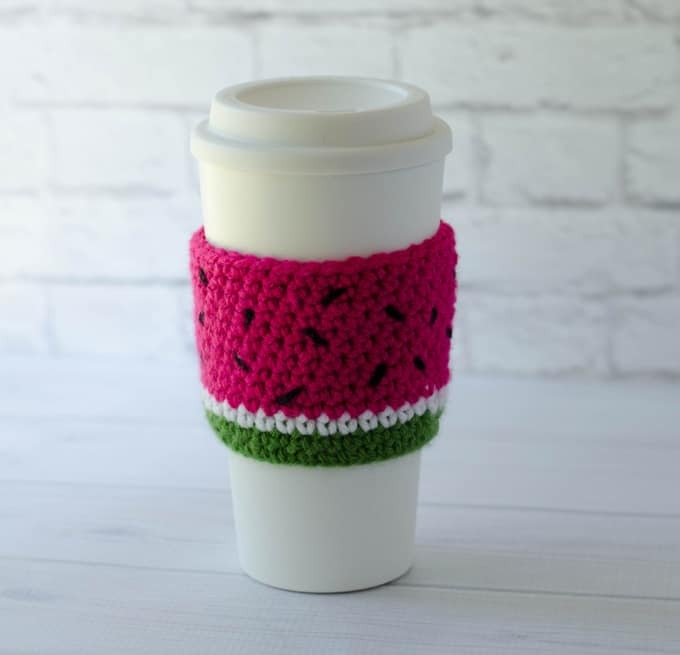 One beautiful watermelon cup cozy! Put it on your favorite coffee cup, pour yourself some coffee. Breathe in that beautiful smell and savor the moment. Remember we are all part of one big, crazy, beautiful world. We are born. We live. We die. But in the living, take the time to enjoy the coffee…the crochet.. and most of all…your people. 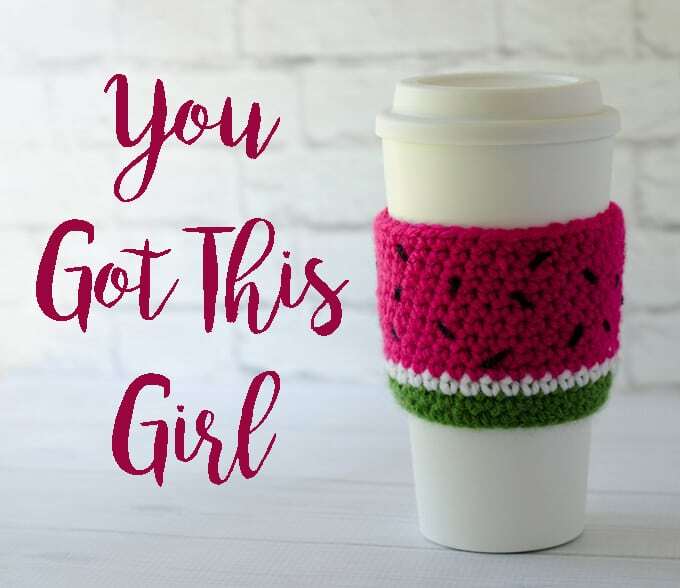 And always, always remember… you’ve got this, girl! You always have!